Here’s a helpful hint for hand-loaders from Sierra Bullets. While this article focuses on Sierra’s new Tipped Match-King bullets, the recommended solutions apply to other bullet types as well. The article explains how sharp edges on a seating stem can cause a ring to be pressed into the bullet jacket — especially with compressed loads that resist downward bullet movement. Here Sierra technician Rich Machholz diagnoses the problem and provides a solution. Now that the new Tipped MatchKing® (TMK) bullets are being shipped and shooters are putting them to use I have received several calls regarding marking on the bullet ogive from the seating stem. Some older seating stems might even bear against the tip of the bullet which can make a slight bulge in the jacket just below the junction of the resin tip and the copper jacket in a compressed load. If this is the case there is not a ready fix other than calling the die manufacturer and requesting a new deeper seating stem. If the seating stem is of proper depth the culprit most generally is a thin sharp edge on the inside taper of the seating stem. This is an easy fix that can be accomplished by chucking a spare 77 grain bullet in your drill, coating it with valve grinding compound or even rubbing compound or in a pinch even tooth paste. * Remove the seating stem assembly from the seating die. Turn the drill on and put the seating stem recess over the spinning bullet with the polishing compound to break or smooth the sharp edge that is making the offending mark. This might take more than one application to get the proper polish depending upon what you use, but the more you polish the better the blend of angles which will [ensure the stem matches the bullet contours, not leaving a sharp ring]. If the above is a little more than you care to tackle you might try very fine emery cloth twisted to a point that can be inserted into the mouth to the seating stem and rotated to polish the inside to eliminate any sharp edges that might be present. And last but certainly not least. Actually, even though we don’t say you need additional data for the TMKs, remember you are dealing with heavily-compressed loads in some cases because of the additional bullet length. Due to the additional length of these new bullets and in the interest of gaining some room in the case you might consider trying a slightly faster extruded powder like BenchMark or the 4895s or an even more dense powder like the spherical H335®, CFE223 or TAC. The extra room will allow for trouble free bullet seating also. Good luck and remember we are no further away than your telephone: 1-800-223-8799. Share the post "Polish Inside of Seating Stems to Avoid Ring Marks on Bullets"
An accurate, self-loading .22 LR rifle, such as this Volquartsen, is our gun of choice for speed shooting with rimfire reactive targets. Reactive targets offer “instant gratification” — with every hit your target moves, spins, or falls. Shooting reactive targets with a rimfire rifle is fun AND affordable. Times are a-changin’ — rimfire ammo prices have dropped dramatically, so you can now get very good rimfire ammunition for just four bucks a box, such as Norma Tac-22. That works out to a mere eight cents a round. At that price, you can afford to shoot every weekend. RimfireSteel.com offers the unique Rimfire Steel Biathlon Target, a scaled-down Biathlon target designed for use at 50 feet for training and recreational shooting. This is one of our favorite rimfire targets. You can increase the level of challenge by moving it to 25 yards! Watch the video — it shows how to reset the five plates remotely with a lanyard. For .22 LR fans, the folks at Action Target have created a whole series of steel rimfire targets. Much lighter than their centerfire counterparts, these rimfire targets are easier to transport and easier to set up. With this wide selection of reactive targets, you can create your own shooting gallery. Share the post "Rimfire Reactives — Spinners, Dueling Trees, Plate Racks & More"
Like many of our readers, your Editor got his first introduction to organized shooting sports through the Boy Scouts. At a Scouting summer camp I participated in competitive target shooting with both airguns and single-shot .22 LR rifles. That experience helped me earn my Rifle Shooting Merit Badge. That marksmanship badge remains one of the most popular non-mandatory Merit Badges. Since 2009, over 350,000 Rifle Shooting Merit Badges have been earned by young scouts. Given the vital role Scouting plays in developing the next generation of shooters, we’re pleased that Daisy has agreed to partner with the Boy Scouts of America (BSA). This agreement makes Daisy the official airgun of the Boy Scouts of America. This partnership makes Daisy’s unique inflatable BB Gun ranges available to the BSA’s 274 local councils as well as BSA camp sites across the country. Instructors emphasize shooting safety rules and teach basic marksmanship, including breath control, trigger pull, sight picture and more. Daisy’s unique inflatable BB Gun Ranges can be deployed at Scout camps, and as well as hunting and conservation events. These mobile ranges allow instructors to teach young poeple gun safety rules and marksmanship skills. When set-up, the range measures 22′ 5″ long by 9′ 6″ wide by 8′ 6″ tall. Share the post "Daisy Will Support Boy Scouts’ Marksmanship Training"
This article comes from the Criterion Barrels website. It provides good, conservative advice about barrel cleaning. Understand that cleaning methods may need to be adapted to fit the amount and type of fouling (and the particular barrel). In general, we do try to minimize brushing, and we follow the procedures Criterion recommends respecting the crown/muzzle. We have also had very good success using wet patches followed by Wipe-Out bore foam. Along with the practices outlined by Criterion below, you may want to try Wipe-Out foam. Just be sure to use a fitted cleaning rod bore guide, to keep foam out of the action recesses and trigger assembly. What is the Best Way to Clean a Rifle Barrel? We are asked this question quite frequently alongside requests for recommended break-in procedures. Improper barrel cleaning methods can damage or destroy a barrel, leading to diminished accuracy or even cause a catastrophic failure. When it comes to barrel maintenance, there are a number of useful techniques that we have not listed. Some techniques may work better with different barrel types. This series of recommendations is designed to incorporate a number of methods that the Criterion Barrels staff has used successfully both in the shop and on their personal rifles. Please feel free to to list your own recommendations in the below comments section. There are a number of schools of thought relating to the frequency in which a barrel should be cleaned. At minimum we recommend cleaning a barrel after each shooting session to remove condensation, copper, and carbon build-up. Condensation is the greatest immediate threat, as it can cause the barrel to rust while the rifle sits in storage. Copper and carbon build-up may negatively impact future barrel performance, increasing the possibility of a failure in feed or function. Fouling should be removed whenever possible. The below tips will help limit the wear of different parts of your barrel during routine maintenance, helping extend the life of the barrel and improving its performance. The crown is the portion of the barrel where the bullet loses contact with the lands and grooves and proceeds to exit the firearm. The area most critical to accuracy potential is the angle where the bullet last touches the bore of the barrel. Avoid damage to this area by using a plastic toothbrush and CLP type cleaner to scrub the crown from the exterior of the barrel. Even the most minimal variation in wear to the crown will negatively impact barrel performance, so be careful to avoid nicking or wearing away this part of the barrel. When running a patch through the barrel, place the muzzle about a ¼” from a hard surface that runs flat at a perpendicular angle to the cleaning rod’s direction of travel, like a wall or the edge of a work bench (pictured). When the jag impacts the hard surface, retract the cleaning rod and remove the patch. By withdrawing the jag prior to its exit from the barrel, you are limiting the possibility of the brass dragging upon the crown if the rod is at all bent or misaligned. The soft cloth patch will continue to serve as the point of contact between the jag and the barrel, minimizing potential wear. If possible, insert the rod through the chamber, pushing it forward toward the muzzle. Some rifles, such as the M1 Garand or M14, will require you to insert the cleaning rod through the muzzle. In these situations the use of a cleaning rod guide is recommended to limit the friction placed upon the crown. Avoid using cleaning rod segments for scraping carbon from the recessed muzzle of an AR-15 barrel. We used this trick in the Marine Corps to impress the armorers and NCO’s with the cleanliness of our muzzles, but it likely played a significant role in reducing the service life of the rifle barrel in question. Use a Q-Tip soaked in solvent to remove any copper or carbon residue from the recessed muzzle of an AR-15 barrel. A little bit of remaining carbon on the face of the muzzle will not negatively affect bullet travel so long as the crown edge remains consistent around the circumference of the bore. This portion of the barrel may experience reduced efficiency due to copper fouling and cleaning rod damage. If copper fouling takes place during the initial break-in of the rifle, make sure to check our barrel break-in article. For regular maintenance we suggest using a single piece coated cleaning rod rather than the traditional segmented rod or bore snake. While segmented rods and bore snakes may be convenient for field use, the corners between the segments may bow out and catch on the lands, scraping along the length of the rifling. Residual grit and particles from expended cartridges may also get caught between segments, resulting in an abrasive surface working its way down the length of the barrel. Most bore snakes will remove significant amounts of carbon fouling, but may fall short in the removal residual carbon buildup and copper fouling during deep cleaning. Good rods can be sourced from multiple manufacturers, but we have found good results using both Pro-Shot and Dewey brand products. General cleaning requires the use of patches rather than nylon or brass bore brushes. Brass brushes may be required when aggressive cleaning is required, but can lead to unnecessary wear on the barrel if used frequently. This is not due to the nature of the soft brushes themselves, but from the abrasive particles of grit that become embedded in the material that is being run repeatedly through the bore. We recommend the use of bore guides when cleaning from both the muzzle and breech. These bore guides will help serve to protect the crown and throat from cleaning rod damage. If significant resistance develops while running the cleaning rod through the bore, no attempt should be made to force it in further. Back the rod out and inspect the barrel to determine the cause of the resistance. The jag may be pushing between a bore obstruction and the rifling, digging a divot into the barrel before pushing the obstruction back through the muzzle. One way to minimize the risk of a stuck rod is by utilizing a slightly smaller patch during the initial push. 1. Check to make sure the rifle is safely unloaded. 2. Carry out any necessary disassembly procedures prior to cleaning. 3. Remove bolt (if possible) and insert fitted cleaning rod bore guide in action. 4. Soak a patch in bore solvent (similar to Hoppes #9). 5. Center and affix the patch on the brass jag, inserting it into the chamber end of the barrel. A misaligned patch may cause the jag to damage the lands of the rifling, so make sure the patch is centered on the jag. 6. Run the patch the full length of the barrel, retracting it upon reaching the end of the muzzle. 7. Let the solvent sit for a minute. 8. Continue to run patches through the bore until carbon residue is minimized. 9. Run a dry patch through the bore to ensure carbon residue has been removed. 10. Soak a patch in copper solvent (Sweet’s or KG-12). 12. Repeat this process until no blue residue remains on the patches. 13. Run a patch of Hoppes #9 and a dry patch through the bore to neutralize the copper solvent. 14. Inspect the barrel prior to reassembling the rifle, verifying that no bore obstructions remain. *Please note that some ammonia-based copper solvents may prove to be corrosive if left sitting in the barrel for an extended period of time. It is essential that these solvents be removed within 15 minutes to avoid ruining the bore. Proper cleaning of the chamber is a critical component of a general cleaning procedure. Carbon rings can build up near the neck and throat of the chamber wall, leading to feeding malfunctions and pressure spikes inside the chamber. The chamber can be the trickiest part of the barrel to effectively clean, due to its fluctuation in size and the awkward ergonomics often required to remove carbon residue. Numerous chamber specific devices have been created to address this problem, and while some should be avoided (steel chamber brushes), others can be used to great effect (cleaning stars and plastic dental picks). The simplest approach to cleaning a chamber is to apply solvent to a couple patches, and use the cleaning rod to spin the wadded up patches inside the confines of the chamber. This should aid in removing any excess carbon. A Q-Tip can be used to reach portions of the chamber unreached by patches. While most cleaning components can be found at your local gun shop, some specialty items may need to be sourced through online retailers such as Brownell’s. Criterion utilizes both Dewey and Pro-Shot brand cleaning components during our day-to-day operations. 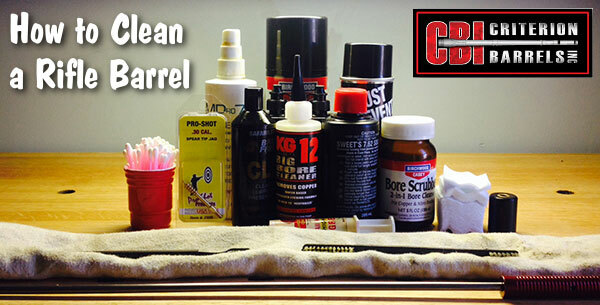 Do you have any rifle cleaning tips or tricks not mentioned in the above article? We’d love to hear about them. You can post your comments below. Share the post "Barrel Cleaning TECH TIPS — Criterion’s Advice for Bore Cleaning"